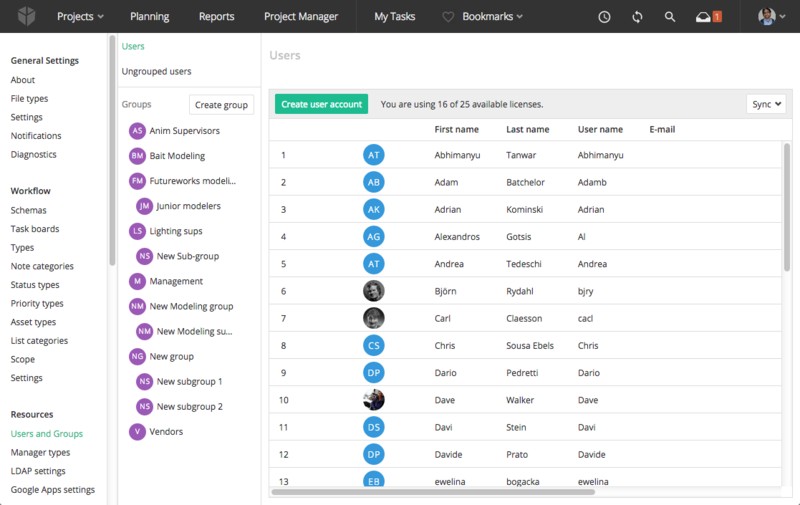 You can manage your users via the Users and Groups page by navigating to System settings ‣ Resources ‣ Users and Groups. 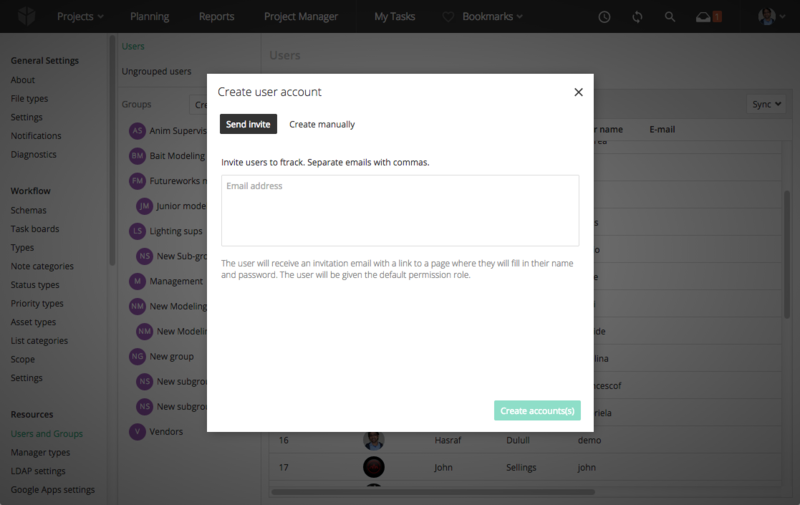 To create a new user account, click the Create user account button, and then choose to either send an invite or create the user account manually. 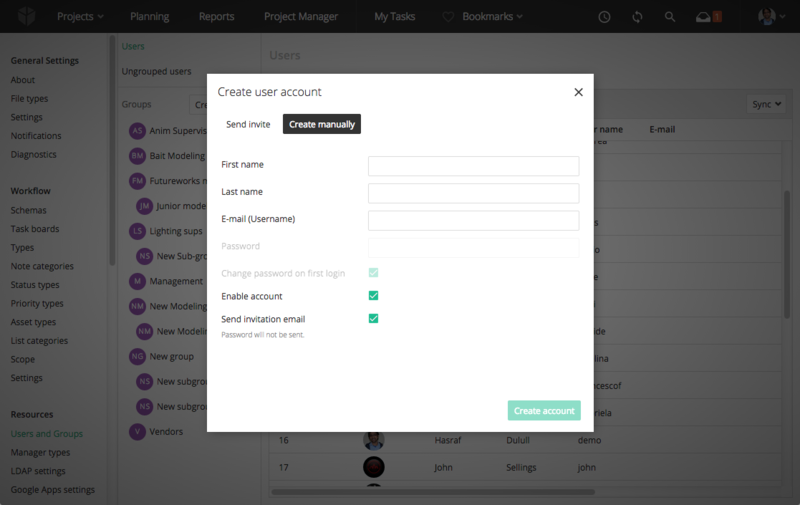 When creating a new user account it will be given a default role which can be changed later. You can change which role is default from System settings ‣ Security ‣ Settings. Sending invites is the simplest way of creating users. Just enter the email address and press Create account(s). The user will receive an email with the subject <your name> has invited you to ftrack. The email contains a link which the new user can click to enter their name and password. You can invite multiple users at the same time by entering multiple email addresses separated by commas. If you want to have control over what name and other attributes a user receives, you can choose to create your users manually. To create a user account manually, simply select Create manually, enter the details and press Create account. The user’s email address and username which is used together with the password to sign in. All ftrack notifications will be sent to this email address. The user’s password. You may either provide a password for the user, or select Send invitation email to send out an email to the user so that he/she can set their own password. Force the user to set a new password after signing in. If the user is not enabled, he/she will not be able to sign in. Send an invitation email to the user so that he/she can set their own password.